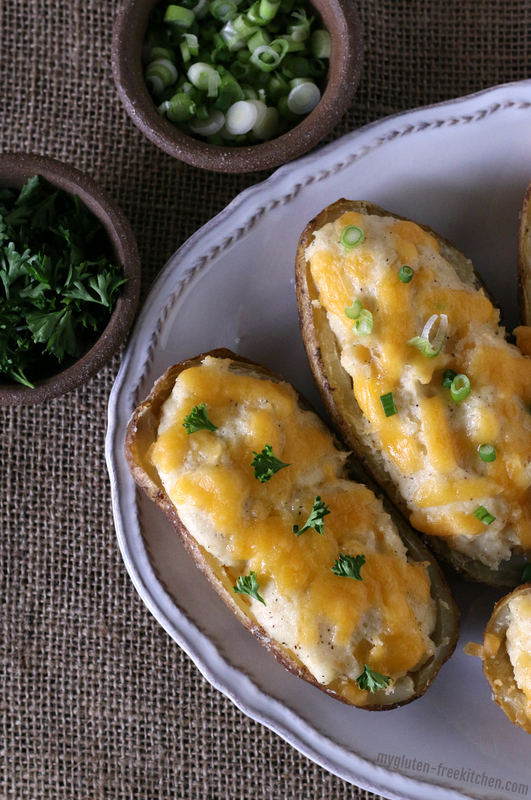 A holiday meal wouldn’t be the same at my house without these cheesy, creamy, flavorful twice baked potatoes that are naturally gluten-free. I’ve been making these for almost 20 years now, tweaking them to get them perfect! I’m already thinking about our upcoming holiday meals. I’m truly a creature of habit and make the same items for our holiday meals each year. I get creative with the desserts, but I prefer my tried and true favorites for our Easter, Thanksgiving, and Christmas dinners. I’ve been making these twice baked potatoes for years for our holiday dinners. I serve them alongside our honey ham, glazed sweet potatoes, and gluten-free pull-apart dinner rolls or gluten-free biscuits. My kids already love the food traditions we have at the holidays and look forward to eating all their favorite foods. 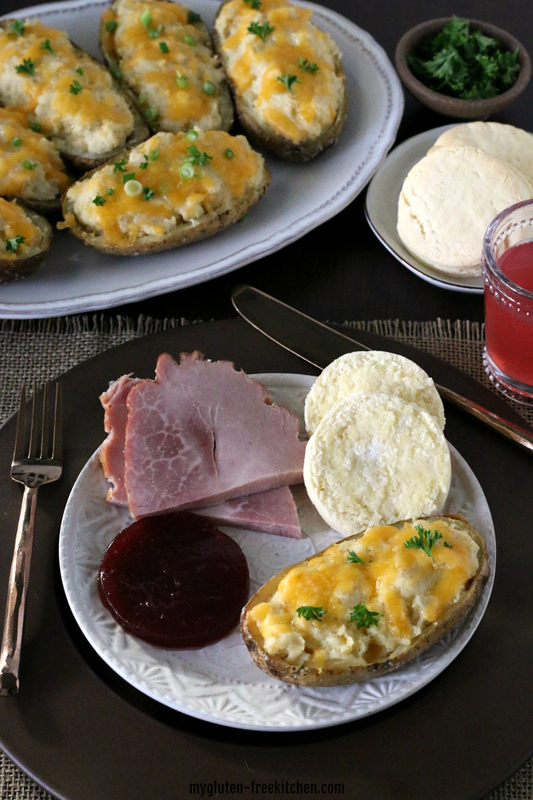 A holiday meal wouldn’t be the same without these cheesy, creamy, flavorful twice baked potatoes on our plates. Since they are a bit of work, I pretty much only make them for the holidays. But sometimes between the holidays we’ll get a real craving for them, so I’ll make a batch of these twice baked potatoes for just our family of four. I enjoy having the leftovers for lunches for several days after our meal. One of these with some leftover sweet potatoes and fresh fruit makes a great “Mom Lunch” for me! Russet Potatoes: Use the largest Russet potatoes you can find! They’re sometimes called Bakers or just Baking potatoes at your store. Sour Cream: You can use regular or light sour cream. Milk: Use whatever you have on hand – I usually use 1 or 2 percent, but have used whole milk too. Granulated garlic or garlic powder is one of our favorite seasonings. You can use granulated onion or onion powder instead. Cheese: I always use Cheddar cheese – sometimes medium cheddar and sometimes sharp Cheddar. Feel free to use another cheese that you prefer too! I start by cleaning the large potatoes, pricking them with a fork, and then coating with olive oil. Then I sprinkle them with coarse sea salt and place in a preheated oven. I usually place a pan or sheet of foil on the oven rack that is below the one the potatoes are on, just to catch any oil or salt drippings. Helps keep my oven clean! Once the baked potatoes are finished baking, after 1 hour to 1 1/2 hours, then I slice each potato in half, and place all of the halves on an aluminum foil lined baking sheet (again for easy clean-up). My tip is to use a grapefruit spoon to scoop out the potato from each potato half, leaving just around 1/4″ of potato with the skin to make a shell that you’ll fill later. 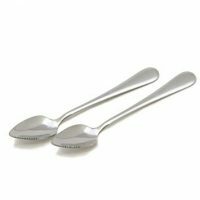 If you don’t have any grapefruit spoons, order some here on Amazon! They’re so handy! All of the potato insides are added to a large bowl which you’ll add all of the remaining ingredients to. A few minutes with a hand mixer and you’ve got creamy, cheesy, flavorful filling that’s like mashed potatoes. You can have it be more chunky or more smooth – just mix until it’s your desired texture. Next you scoop the filling back into the potato skins, sprinkle with some additional cheese, and bake again. That’s where the “twice baked” term comes from! Instead of the first baking of the potatoes, you could do that first step in the air fryer instead by making these air fryer baked potatoes. Then you’d just follow the remaining steps in my recipe for scooping out the potato, making the filling, and baking afterward. I hope you and your family love this recipe as much as mine! Enjoy! 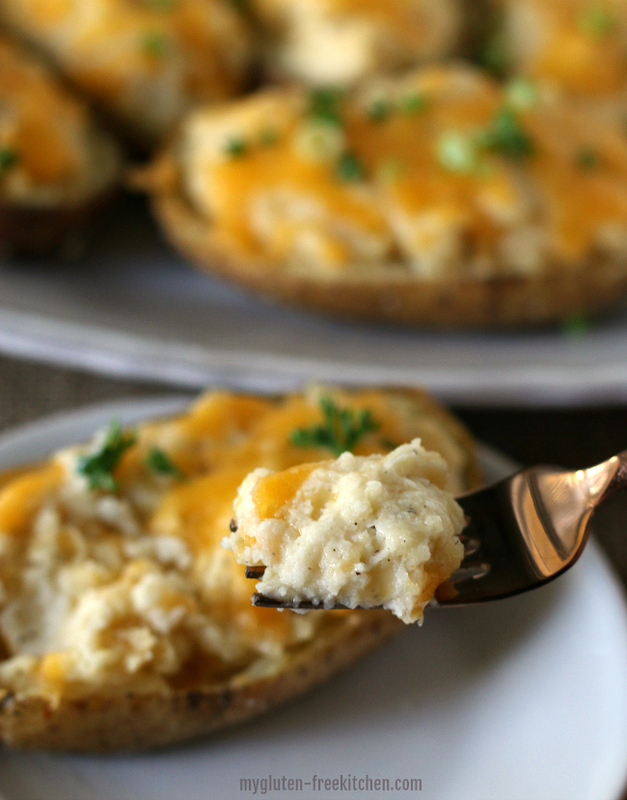 Twice baked potatoes are my favorite holiday side dish! Any leftovers are great for lunches! Scrub the potatoes. Pierce the skin several times with a fork. Over your kitchen sink (to make cleaning up mess easier), rub the skin of each potato with olive oil, then sprinkle with coarse sea salt. The easiest, most efficient way I've found to do this is for 2 people to work together. One rubs oil on hands and potato and keeps holding it while other person sprinkles the salt on. Salt person is also in charge of opening oven door so oil person isn't getting everything oily! Place each pieced, oiled, and salted potato on the top rack of your preheated oven. I like to place a rectangle of aluminum foil on the rack below to catch any drippings of salt or oil, but that's optional. Bake for about 90 minutes, or until, using an oven mitt, you can gently squeeze the potato and have it give instead of being firm. Remove from oven and let sit about 5 minutes. Slice each potato down the center. Line a rimmed baking sheet with aluminum foil. Place each half on the baking sheet. Scoop out the flesh of each potato into a large bowl. I have found that a grapefruit spoon works perfectly for this! Leave about a 1/4" thickness of potato skin in tact. 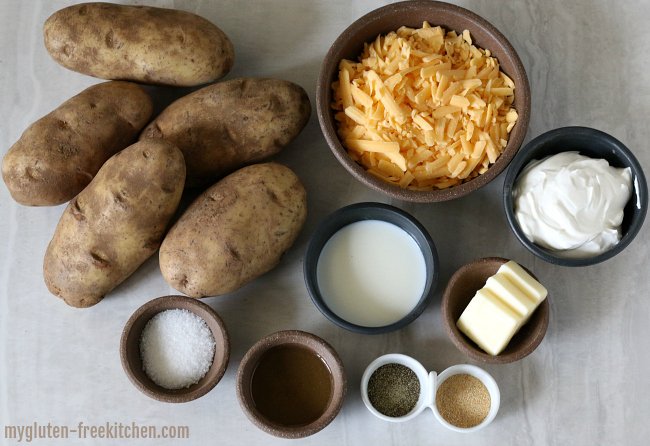 To the potato flesh in your large bowl, add sour cream, milk, butter, salt, pepper, and 1 cup of the cheddar cheese. Mix with a hand mixer or stand mixer until well blended and creamy. Spoon the potato mixture into the potato skins. Sprinkle remaining 1/2 cup shredded cheese over all potato skins. Bake at 350° for 20 minutes, or until warmed through and cheese is melted. Store leftovers in tightly sealed container if refrigerator. Warm in oven or microwave. This recipe is scaled for 10 servings (half a potato per person since you're using large potatoes). If you have more to feed, feel free to double the amount. 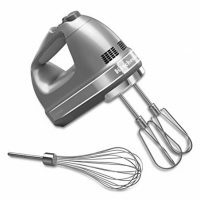 However, mixing double the filling would be difficult for a hand mixer, so either make the filling in two batches, or use a heavy duty stand mixer. 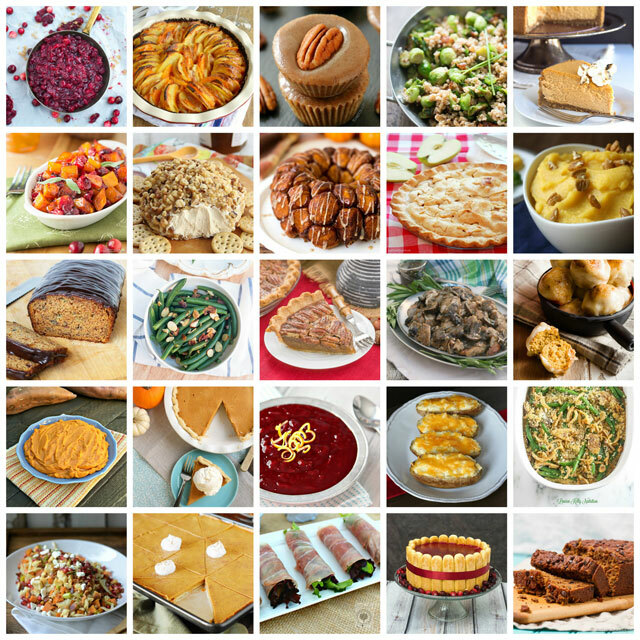 I’ve teamed up with 24 other bloggers that are all posting Thanksgiving recipes today! Not all of the recipes are gluten-free, but there are many, especially the side dishes, that are naturally gluten-free or you can easily adapt. I’m excited to try several of them! Be sure to check them all out! Just click on the photo of the recipe you want to see and it will take you right to it, or click on the links below the image. Always have to love a great potato dish! Yum! Hi, Michelle! 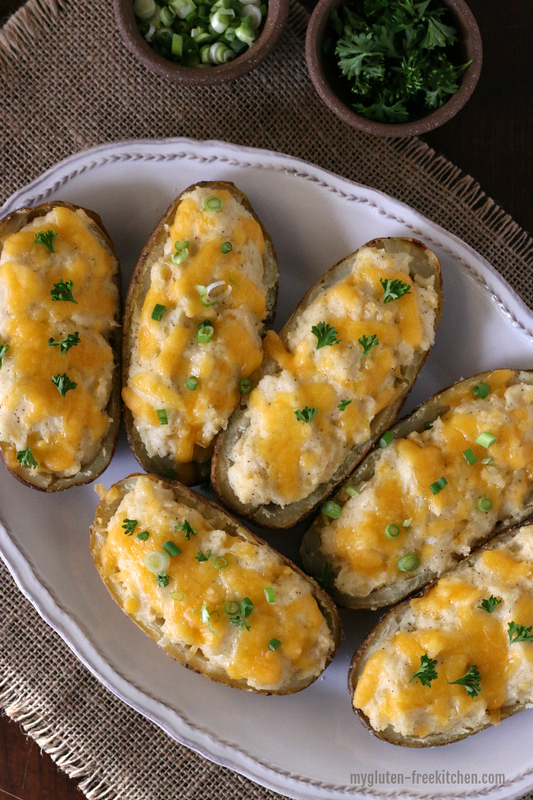 Love these Twice-Baked Potatoes … and agree about having leftovers as a perfect lunch. As for me, my absolute favorite Thanksgiving side dish is the stuffing. Can’t get enough of it!! My favorite side dish on Thanksgiving is the homemade stuffing. I absolutely LOVE my sister’s dip! I fill up it before our meal even begins!! Favorite side dishes are soft warm rolls and stuffing. Love your recipes!! My family always looks forward to trying something new! I’m hoping you will have a rolls and stuffing recipe. Those are my biggest weakness!! My favorite side dish is brussels sprouts. I love making baby glazed carrots.. so so good! I love these potatoes and miss our friend Christmas dinners! Love you stuff Michelle. Thanks for sharing. My favorite holiday side dish is sweet potato soufflé! My favorite is the cheesy potatoes that come out of a box, LOL! I love my Sweet Potato Casserole! My favorite holiday side dish is cornbread stuffing/dressing! My favorite Thanksgiving side dish is my Baked Bourbon Cranberries – so delicious!! My favorite side is a wild rice casserole. I big puffy heart twice baked potatoes. I never would have thought to serve them at our Thanksgiving Feast. Genius! The gravy. I don’t know whether to be embarrassed about that or not. I always look forward to homemade mashed potatoes and gravy and the dressing! I love the stuffing, the sweet potatoes, the pies!!! I love it all. My favorite holiday side dish is my mom’s cranberry and apple stuffing!!! It is so good! My favorite side dish is my grandmothers cranberry stuffing. My favorite holiday side dish is pumpkin pie. My favorite holiday side dish is green bean casserole. I love stuffing with gravy. I love candied sweet potatoes for the holidays! Looking forward to trying your recipe! I like the cornbread dressing and cranberry sauce. MMmmmm I love Thanksgiving! Mostly, green beans with bacon and sweet onions. Thanks. 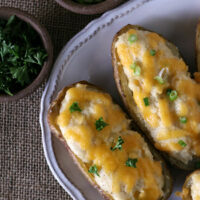 These are different from the recipe I usually use for Twice Baked Potatoes, but they sound delicious! My favorite Holiday side dish are cheesy potatoes! My favorite holiday side dish is sweet potatoes, I like them in a casserole. The potatoes have to be cubed and not too mushy, picky I know! My favorite sweet potato casserole. My favorite holiday side dish is stuffing with cranberries. My grandma’s cornbread pudding casserole. Haven’t made these in a long time. I like your meal idea….ham, twice baked potatoes and glazed sweet potatoes. My favorite side dish for Thanksgiving is stuffing with sage gravy! Since I recently have gone gluten free and close to becoming grain free I am looking for a cornbread stuffing recipe. I love the twice baked potatoes! But, my favorite Thanksgiving food is my mom’s Southern Cornbread Dressing! Yum! No one makes it the way she does! My favorite holiday side dish is Sweet potatoes with marshmallows and brown sugar on top! I love stuffing for the holidays. Green bean casserole is my favorite for sure! My favorite holiday side is roasted root vegetables. Apple and Potato Au Gratin, you layer slices of green apples and potatoes and pour over a white cheese sauce and bake, it is a lot of work doing all the slicing, but so delicious. I have recently became a big fan of brussel sprouts! My favorite holiday side is stuffing! My favorite side dish is green bean cassorol! Thank you for the chance! My favorite side dish is green beans with bread crumbs! My favorite holiday side dish is homemade cranberry sauce!! Ohhh, I love potatoes and these look/sound delicious! Dressing is my favorite, by far! I love a sweet potato casserole with pecan streusel topping. My favorite side dish for the holidays is definitely stuffing! My favorite holiday side dish is my dad’s stuffing recipe. I like a good dressing. My favorite side for the holidays is green bean casserole. My favorite side dish is sausage mushroom stuffing. I love some cheesy mashed potatoes! sweet potato casserole, it is like dessert to me!